This popular book is back in print and updated for a limited run. Step by step overview of restoring, visible, clock face and electric gas pumps. 1000+ pictures of pumps showing color schemes, signs, decals and globes for correct restoration of many brands and gas grades over the decades. Inside you will find over 280 pages filled with information all about restoring your gas pump. 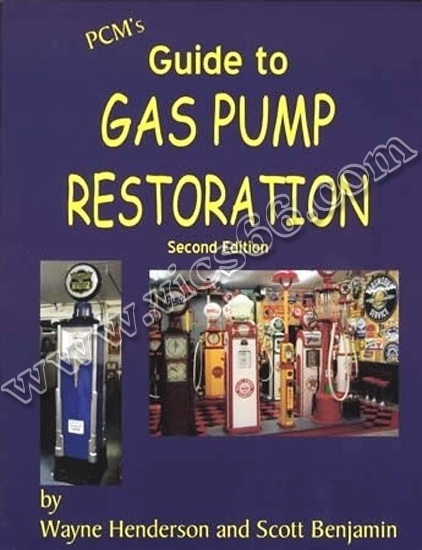 Step-by-step restoration of three popular styles of gas pumps, including visible pumps, clock face pumps, and calculating pumps is included. But that's not all! There are also over 1,000 full-color diagrams of original gas pump color schemes, from throughout the Twentieth Century. Our diagrams include pump color placement, sign or decal design and placement, proper globe selection, and more. As an added feature, over 600 porcelain, tin and plastic pump signs are pictures in full color, as in over 400 designs for ad glass panels, including the curved panels for the popular National art-deco pumps of the 1940s and 1950s. Paint color codes, tips for finding and handling pumps, and a reference guide to sources of supply round out this work, this most complete gas pump book ever!